Protective leather sheath for 3.5" length scissors. Airline safe way to cut threads. These recessed razors are safely contained in a decorative pendant. Add a satin cord and wear it as a necklace. Available in Old Gold and Dark Silver. Sturdy 3.5" scissors with protective sheath. Available with blue, emerald, purple, or red handles. Sharp, curved blades with safety cap for easy storing. Finished with needle sharp points and precision edges for intericate embroidery. Includes a leather sheath. 3.5" stork embroidery scissors with nickel-plated blades and gold-plated handles. Includes fitted leather sheath. 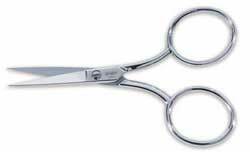 4" chrome-plated embroidery scissors with larger handles. These scissors are comfortable for larger fingers. Includes fitted protective sheath. 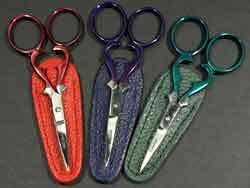 4" curved blade embroidery scissors, chrome-plated with fitted leather sheath. 4" featherweight black nylon thread snippers with sharp stainless steel blades. 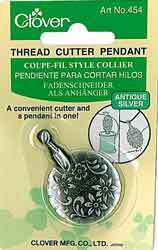 Knife edge for hardanger embroidery, general needlework and craftwork. In a fitted leather sheath. 4" chrome-plated embroidery scissors with serrated blade. Great for cutting metallic and real metal threads. Includes fitted protective sheath. 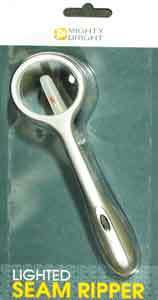 Curved stainless steel tweezers with attached 6x optical quality acrylic resin magnifier. Ideal for needlework, jewlry, stamp collectors and scientists. Don't ruin your favorite pair of embroidery scissors by cutting metallic threads! These 22 carat gold-plated scissors have a mini-serrated blade and are specifically designed to cut metallic and metal threads with ease. Keep a pair handy. 4x magnifier; 1.25" lens; ergonomic handle; rotating arm; bright white energy-efficient LED; LED lasts 100,000 hours; sharp metal blade; 3 micro cell batteris (included); battery life - 7hrs. Folding stainless steel safety scissors. Special razor sharp curved blade glides through serged and regular seams. 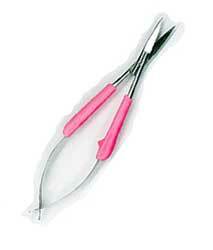 Very thin curved blade makes it easy to rip straight or serged stitches, or to remove mistakes in needlework! Wide plastic handle makes it comfortable to use. Includes plastic safety cover.